We are now back in Christchurch for a couple of weeks before going to Auckland to look after a couple of teenagers while their parents (our son and d-in law)are in Rio for the games - watching not competing. This means I am unlikely to get back to Queenstown to do any banding for some time. Didn't do much banding in the last week there, partly due to inclement weather but also due to an apparent lack of birds. There were very few Song Thrush, Blackbird or Silvereye about, these species are probably still feeding on the abundant crop of berries and fruit that are still about. During this last week or so I caught 25 birds off 7 species with 13 new and 12 recaptures. Song Thrush - 0 (1) one of the first Thrushes banded and currently the oldest recap. Bellbird - 0 (6) The last 13 Bellbird caught have been recaps with the last new bird caught back on 21 June. Perhaps I have banded them all - but I doubt is. Recaptured the first one banded there. Tui - 4 (2) As with Bellbird recaptured the first Tui banded at the site. Annette is a long term and very experienced member of the Wellington based banding group. She wrote the following report about preparing Robins to demonstrate some aspects of their natural behaviour to visitors at Zealandia. N.I. Robin foraging and caching demonstrations at Zealandia. As part of some of the daily Walk and Talk sessions at Zealandia, guides are demonstrating N.I. Robin foraging and caching behaviour. Learning to associate a particular sound with the possibility of food, uncovering food by tossing aside material, and caching food, are all aspects of the Robins’ natural behaviour, and these demonstrations provide an opportunity for visitors to observe them at close quarters. To prepare for these demonstrations we looked for male robins along the route the walks usually take, and found four suitable candidates. Because males are dominant at food sources, especially outside the breeding season, if we had chosen females they would probably have been aggressively chased, and we always try to minimise the effect our actions have on natural behaviour. Robins are territorial, and pairs generally divide their territory in the winter and the females stay in their own part to avoid any aggressive interaction. It was also important for the males to be quite a way apart from each other, and for our interaction with them to take place towards the centre of their territory, to avoid the likelihood of our actions precipitating a territorial dispute. To make sure these precautions are effective it is of course important that the resident male is the only Robin that is fed at each site, so each bird had to be banded so it could be positively identified. They were caught using a drop trap baited with a mealworm. When the bird moves towards the worm at the back of the cage the string attached to the stick is pulled and the trap drops gently down. Very basic, but generally very effective. 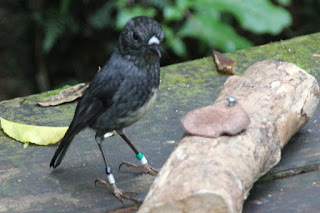 Once caught, each bird was banded with a unique combination of four bands. A metal band with a unique number is the crucial identification, but so they can be identified at a distance three colour bands are also used, one above the metal band and the other two on the other leg. These bands are read from the top down, and the bird’s left leg first, then right leg. Most of the Robins in Zealandia are not banded, but on the east side of the upper dam there is a fully banded population of about 100 birds which are used for research. Once appropriate Robins had been found and banded, a spot well away from other robins was chosen for each one, and they were encouraged to respond to a ‘dinner bell’ (2 metal pipes tapped together) by coming to uncover a tasty morsel hidden in a log. In places which have tracking tunnels and a robin population, it is usual for the robins to learn to associate the sound of these wooden boxes being opened with the possibility of an insect feast, so we used this tendency to attract them to a spot where they could be seen clearly by visitors. The Robins were first given a mealworm in the hole in the log with the cover off, so they could see it. When they were used to this, the hole was progressively covered with the leather flap until they learnt to flick it aside, as they would toss aside leaves on the ground to uncover food. When the robin is full, rather than flying away or ignoring the food, as most birds would do, it will carry it off and put it in a cavity in a tree so that it can retrieve it later when it is hungry. This caching behaviour is unique among the birds found in New Zealand. Overseas, species such as Jays and Woodpeckers cache food such as acorns, but this is in response to an abundance of seasonal food available for a limited time (often in autumn), and they use their caches over weeks or months, to supply food when it is scarce in winter. In contrast, the insects that New Zealand Robins eat are available all year round, and are perishable, so they usually retrieve the food within a few hours. They sometimes catch quite large prey such as weta or stick insects. They batter these against a log until they are broken into manageable pieces, but often they do not want to eat them all at once, so their caching behaviour may have arisen as a response to this. 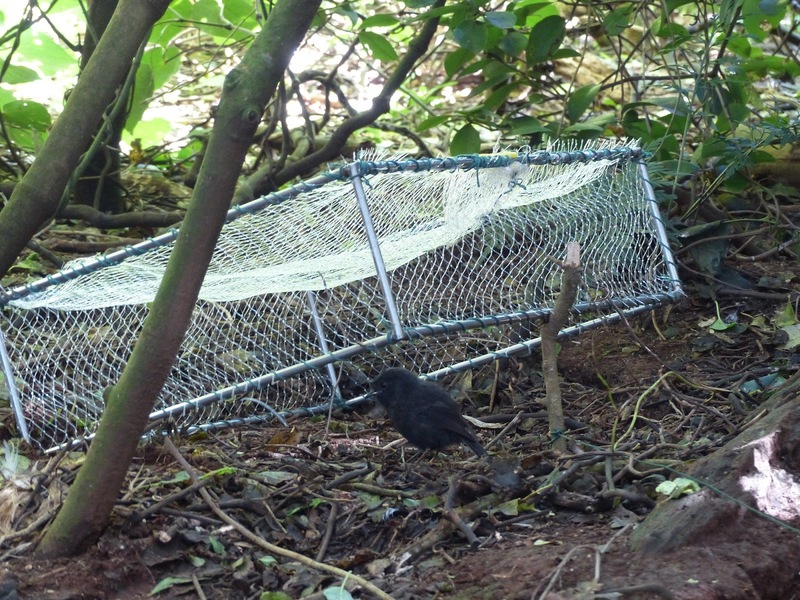 Interestingly, although both the North Island and South Island Robins cache, the black Robin - the third NZ Robin species, which is found only in the Chatham Islands, and whose status is nationally critical – does not.